A wide range of domestic roofing products are available for homeowners in Australia. These products vary significantly in terms of their affordability, weather-resistant capabilities, durability and performance. Below is a separate section for each of these products, detailing its features and applications. One of the most popular roofing material choices among Australian homeowners is metal roofing. 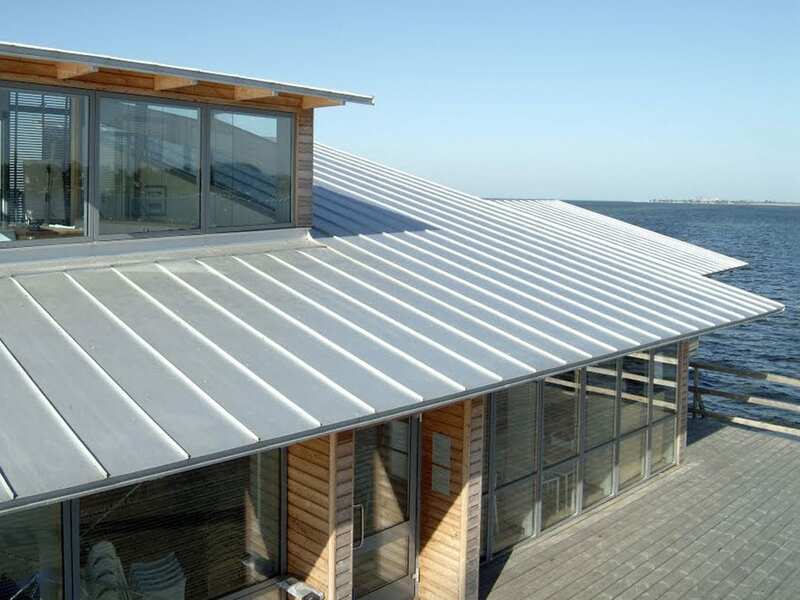 Metal roofing comes in a variety of styles and makes. As the name suggests, it is constructed from metal. A wide range of metals, including copper, tin, zinc, aluminium and steel are used in creating metal roofing. Each metal type has its own pros and cons. Here is a quick rundown of each. Copper has been used as a roofing material for centuries. 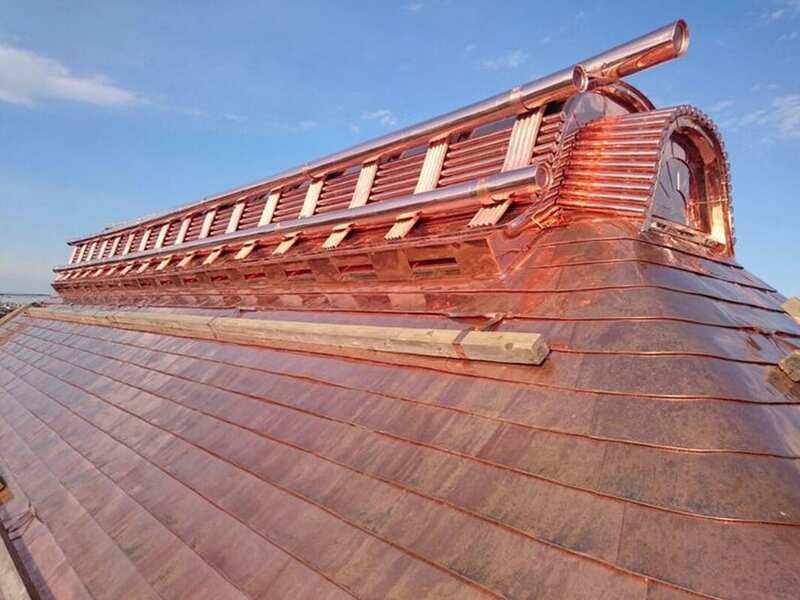 Compared to most other materials used in metal roofing, copper is softer. This has its advantages and disadvantages. Being softer means that copper will easily dent in a region where hailstorms are common. The good thing is that it can also dampen the impact at the same time and prevent the roof from cracking or puncturing under the impact of a large hailstone. 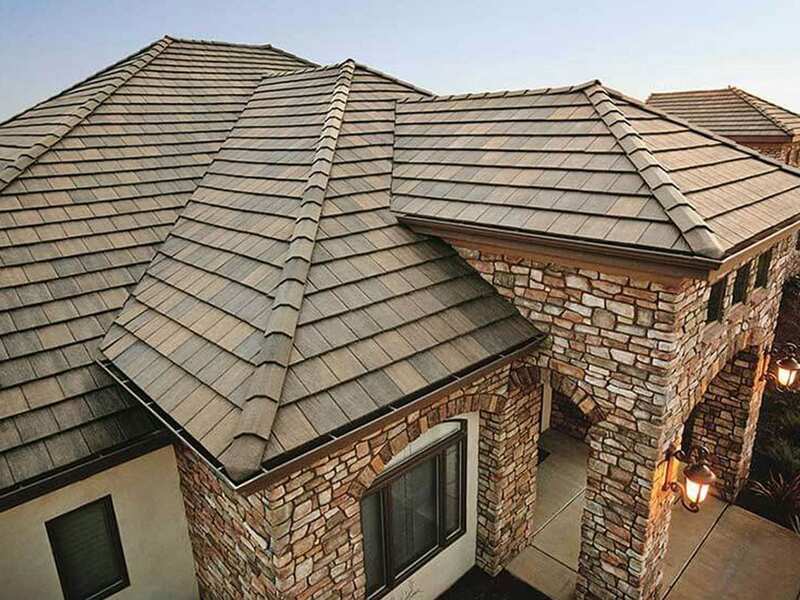 Copper looks great, so it offers a classic aesthetic value to your roof. At the same time, it is incredibly durable and will last for literally above a 100 years. Like copper, zinc is also another extremely long-lasting metal. Zinc roofs can also last upwards of a 100 years. Once installed, they don’t need to be replaced throughout the life span of most homes. At the same time, zinc has a significantly lower melting point, so it can be easily heated and molded to various shapes, requiring less energy. This makes it a more eco-friendly option. It is also 100% recyclable. Also like copper, zinc is soft and may incur dents under a barrage of hails. Frequent exposure to water may also result in a chalky residue on the surface, although zinc roofing can maintain a good aesthetic look with regular maintenance. Compared to some of the more common metal roofing materials, zinc costs significantly more which is why it is used infrequently by homeowners. Steel is one of the more common metal roofing materials. This is for a variety of reasons. Most notably, steel is more abundantly available and costs significantly less. Steel is also a lot harder and can withstand hailstorms, rain, snow and other weather conditions with far better resilience. This is why steel is the preferred roofing option for many homeowners living across Australia. Another great thing about steel is that it is highly recyclable. Rusting is a common problem associated with steel roofing. But this can be handled through coatings, paint layers and regular maintenance. Galvanized steel: Galvanized steel is steel coated with a layer of zinc to protect it from corrosion. The zinc is coated on top of an internal layer of steel. This shields the steel from direct air contact and slows down the process of corrosion. Galvalume Steel: Galvalume steel is quite similar to galvanized steel with the key difference that it utilizes both aluminium and zinc as a coating material. This has the added advantage of giving steel a smoother look and offers better protection from corrosion. Aluminium is another popular material used in metal roofing. It is known for its exceptional durability and strength. Like steel, aluminium quickly reacts with the oxygen in the air. This creates an oxide layer on the metal and prevents it from further corrosion, which is why aluminium is particularly preferred by homeowners in coastal regions. Compared to steel, aluminium is typically costly. It is also offered in thinner panels which may not be as sturdy as their thicker steel counterparts. In high-wind regions, thin aluminium panels may pose a safety risk. For this reason, homeowners in such regions should choose thicker aluminium roofing or go with another option like steel. Aluminium is also highly recyclable. Concrete tiles are another popular roofing option among Australian homeowners. These tiles are available in a variety of colours and shapes. However, they are recommended only for roofs with sharper slopes. Concrete tiles offer an excellent aesthetic appeal as a roofing material. They are also fairly durable and will last above 50 years following the installation. Although their upfront installation costs are steep, their longevity makes them a good roofing option. Concrete tiles roofs are also resistant to insect damage, fires and most weather conditions. Their sturdy make enables them to withstand high winds and hail quite effectively. Another great thing about concrete tiles is that they are environment-friendly. They can also be recycled and reused later. On the downside, concrete tiles require a significant labor and effort for a proper installation. You must choose a seasoned contractor to get the job done so that the tiled roof has the right strength and water-proof abilities. Compared to many other domestic roofing options, concrete tiles are also a lot heavier. This means that you will need to have stronger structural components in place to support a tiled roof. Because they are so heavy and hard, concrete tiles are brittle at the same time. A heavy enough impact or a fall is often enough to shatter them. Concrete tiles are also prone to colour-fading. After nearly 5 to 10 years of installation, you may see them losing their original colour. Although the colour-fade adds its own kind of classiness to these tiles, not all homeowners may prefer it. While concrete tiles bring a classic appeal and a beautiful outlook to your home’s roof, they are not for everyone. Although they require little to no maintenance over time, they can cost a tidy sum and are somewhat less convenient compared to more modern options. Terracotta tiled roofs belong in the same category as the concrete tiled roofs, but with some major differences. Terracotta tiles are made from clay, whereas concrete tiles are made from concrete. For this reason, both share some features but are also markedly different in other ways. Terracotta tiles have been used as a roofing material for a very long time. They have their advantages and disadvantages. Following are some of the most significant pros and cons for this particular roofing option. Very Long-Lasting: Clay terracotta tiles can last a very long time. In most cases, they offer a life of above 100 years when properly installed. This makes them a very good long-term roofing solution for a home and is particularly suitable for you if you intend to stay at the same home for the foreseeable future. Environment-Friendly: Terracotta tiles are an incredibly environment-friendly roofing option. They are made from clay and are composed entirely from composite materials. Another eco-friendly feature of these tiles is that they are highly recyclable. Excellent Insulation: When installed property, terracotta tiles offer great insulation abilities. This means that they can effectively block out the heat in the summers and keep the interior of your house cooler. In summers, the same insulation abilities enable a terracotta tiled roof to prevent the heat from escaping the interior, keeping the house warmer. Weather-Resistant: Terracotta tiled roofs can effectively withstand rain, high winds, snowy conditions, hailstorms and harsh sun. This makes them a perfect weather-proof roofing option for homes across Australia. Zero Maintenance: Once you have a terracotta tiled roof installed, it requires little to no maintenance on your part. However, it also depends on the installation. Most reputable contractors will provide you a guarantee on the tile installation they do. This is why it is important to hire a professional contractor for the installation of a terracotta tiled roof. Costly Option: One of the most significant downsides of terracotta clay tiles is that they cost a lot more than many other roofing options. The upfront costs of the materials as well as the installation costs are steep. In contrast, concrete tiles costs less while colorbond steel and other roofing materials are even more affordable in comparison. Installation: The installation of terracotta tiled roofs is more labor-intensive and costly compared to other roofing materials. It might also take a considerable amount of time and require you to hire a well-experienced contractor. Once installed, the terracotta roof must be checked to ensure there are no leakages or other problems. Required Reinforcements: Different roofing materials have different requirements for the structural components. Heavier roofing materials require stronger structural components. This is particularly true for terracotta tiles which can weigh as much as 850 pounds per square. Costly Replacements: Terracotta tiles are incredibly hard which makes them well resistant to weather conditions. However, they are also brittle and break easily. A fallen tree branch or a misplaced step by someone walking on the roof might break them. If a tile breaks, you will need to replace it which can incur additional costs. Despite their numerous downsides, terracotta tiles remain a popular option for the numerous benefits they offer to homeowners across Australia. For their obvious aesthetic beauty, they are particularly preferred by those seeking to bring a touch of class to their roofs. Slate tile roofs are another variety of tiled roofs. They comprise of tiles made from slate, an incredibly durable and fire-resistant natural material. Like terracotta tiles, slate tiles have been used as a viable roofing material in Australia for more than a century. Compared to other roofing options, slate tiles have their advantages and disadvantages. Following is a quick rundown of each. Aesthetic Appeal: The most notable advantage of slate tiles is the aesthetic appeal they bring to your roof. Slate tiled roofs are known for their classy looks and timeless appearance. For this reason, many homeowners choose this roofing material solely for its outlook. Diverse Options: Traditionally used in its natural colour, slate tiles are today available in a vast range of colour options. They also come with various size and thickness options. This makes them suitable for a variety of roof types. Durability: Slate tile roofs are incredibly durable. When installed properly, they last up to 150 years and more. This makes them one of the most durable roofing options. Their longevity is comparable with other non-metal roofing options such as terracotta clay tile roofs. Eco-Friendly: Slate tile roofs are constructed almost entirely from naturally-occurring substances. They also do not require a lot of energy during the manufacturing process. This makes them an organic and environment-friendly roofing material. Their longevity further ensures that they don’t need to be replaced any time soon. When disposed, they degenerate organically and leave little to no waste. Fire Resistance: Slate tile roofs are known to have excellent fire-resistant properties. They are fully fire-proof, so they can effectively resist external fire hazards such as bushfire risks. In bushfire-prone areas, Australian homeowners can choose this material for its superior fire resistance. Costly Option: One of the most notable downsides of a slate tile roof is its costs. Where terracotta tiled roofs are a costly roofing option, slate tile roofs cost even more. Having a slate tile roof installed at your home translates into a significant initial investment. The initial costs may be offset by the extensive lifespan of such a roof but many homeowners may not choose to spend so much money on this roofing material. Difficult Installation: Some roofs are incredibly easy to install. Other are harder, and yet others are truly a formidable challenge. Slate tile roofs fall in this third category. Regular roofing contractors who do not specialize in installation slate tile roofs are simply not equipped to do the job. So you need to seek a contractor who has extensive experience and specialization in installation slate tiles. Even then, it takes a considerable time, effort and labour to get it done. Heavy Weight: Slate tiles can be even heavier than terracotta tiles. They weigh somewhere between 800 pounds and 1500 pounds. So you need to have your home’s structure evaluated before going for this roofing option. Only if the structure is sound and strong enough to withstand such a heavy roof should you choose a slate tiled roof for your home. If the structure is not strong enough, you may need to invest in additional reinforcements. Prone to Breakage: Slate tiles can withstand the severest of weather conditions, but they are also fragile. If a person walks on them or a tree branch comes crashing down during a summer storm, it can break the tiles. Once broken, you will need to have these tiles replaced which will cost you more. Shingles are a type of roofing material that come constructed from various substances. Shingles are often shaped like tiles but they are significantly thinner and flat in comparison. Asphalt roof shingles are preferred by Australian homeowners for a variety of reasons. For a start, they are incredibly affordable. They are also light-weight and easy to install on most roof types. Available in a huge range of colours and sizes, you can achieve a custom look for your roof using asphalt shingles. 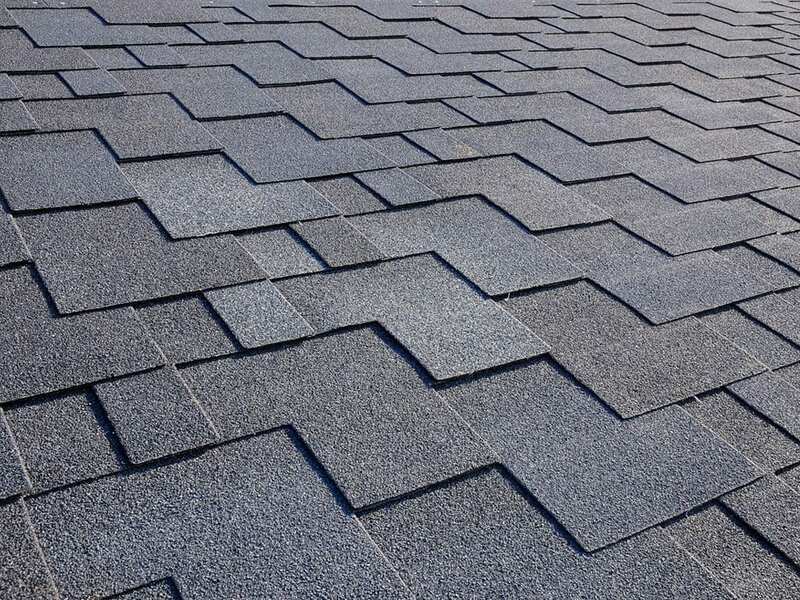 Unlike tiles, asphalt shingles are suitable for low-slope roof pitches as well. They are highly resistant to wind, hail and rain while also offering great fire resistance. Homeowners across Australia also frequently prefer asbestos shingles when doing replacement and repairs on their tiled roofs. This particular variety of shingles offers good durability – most manufacturers would back asphalt shingles with a 40-year warranty. The downside to asphalt shingles is that they are not for flat roofs. They may also incur weather-related damage more quickly than other roofing materials, such as clay tiles. Asbestos has long been used as a material for roof shingles. And it offers better durability than asphalt shingles as well as many other roofing materials. It is also a naturally-occurring material which makes it abundantly available and affordable. However, the decisive downside to asbestos is that it is associated with serious health hazards. Recent medical research shows that exposure to asbestos leads to cancer and other health risks. For this reason, the use of asbestos has drastically declined in recent years. In fact if you have asbestos installed as a roofing material, you should seek to have it removed and replaced on an urgent basis. And make sure to hire a professional contractor who can take suitable precautions and safety measures before doing the job. The redeeming feature of wood shingles is that they bring a great aesthetic appeal to any roof. They can truly make your roof stand out from other roofs in the neighbourhood. 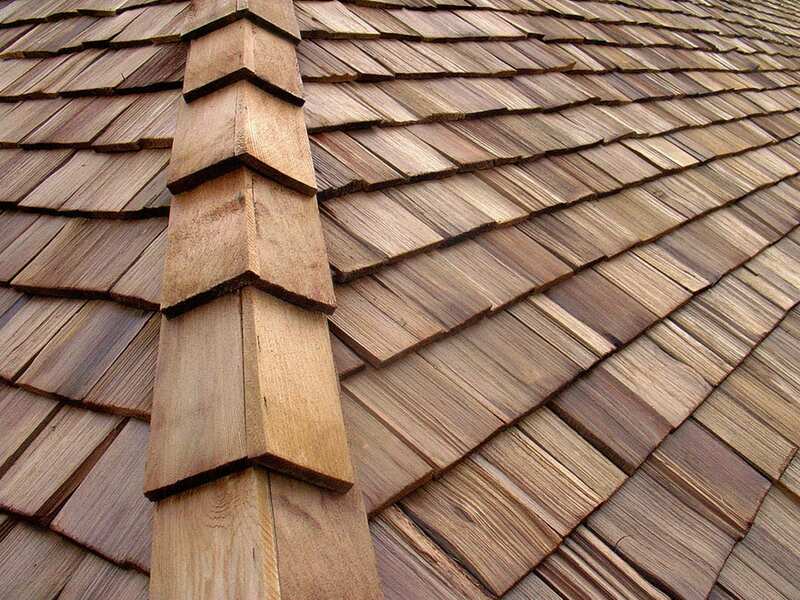 Wood shingles are also quite durable and offer good insulation. So they can help you improve the heating and cooling of the interior space of your home. That being said, wood shingles come with numerous downsides. For a start, wood can easily incur damage from the elements. Rains and humidity can cause significant harm to wood shingles. This can also encourage other insect-related damage such as termite nesting. Wood is also prone to catching fire which makes it particularly unsuitable for most Australian regions, especially the ones with bushfire hazards. Even if you live in an area with no bushfire hazards and a weather that wouldn’t cause the wood to be wet too often, wood shingles require a good deal of long-term maintenance. This is because if left untreated, wood may become warped or bent. In addition to its initial cost, such maintenance will also add to the cost of wood shingles roofing. Fibreglass roof shingles come constructed from composite materials. Using a fibreglass mat, these shingles utilize a coating of asphalt or another material to give them a classic look and finish. They are available in a variety of shapes, colours and sizes, and are suitable for most roof types. Fibreglass shingles are becoming increasingly popular for a variety of reasons. Their overwhelming advantage is that they are able to withstand weather conditions very well. They are also highly resistant to fire and preferred by homes situated in bushfire-prone areas. Fibreglass shingles are also perfect for areas with heavy rainfall and humidity as they absorb no water at all and are also leak-proof. They are also quite light-weight. This makes it easier to carry them and install them on a roof, resulting in lower installation costs. This particular variety of shingles is more environment-friendly as it contains less asphalt than standard asphalt shingles. They are also less expensive and a more affordable roofing solution. This may be one of the key reasons why fibreglass shingles are growing in popularity among Australian homeowners.